A technical paper about growing hair follicles in a laboratory was reported this week as a discovery of a baldness cure in the fryers at McDonald's. "Japanese scientists say eating McDonald's fries could cure baldness," Australia's 9 News reports. No. No they do not. The study, a page-turner entitled "Spontaneous hair follicle germ (HFG) formation in vitro, enabling the large-scale production of HFGs for regenerative medicine", was published online in the journal Biomaterials in November 2017. It says nothing about McDonald's or frying oil. It's a report on how scientists designed a container that could grow thousands of hair follicles suitable for transplantation. Until now, there hasn't been a good way to make new hair follicles in the lab; baldness treatments more often just move hair from one part of the head to another. "The key for the mass production of [clusters of hair-producing stem cells] was a choice of substrate materials for culture vessel," says the corresponding author Junji Fukuda, Professor, Yokohama National University. "We used oxygen-permeable dimethylpolysiloxane (PDMS) at the bottom of culture vessel, and it worked very well." A few outlets picked up the story, but it didn't start making scandalous headlines until somebody realised that dimethylpolysiloxane is also used in frying oil to prevent foaming. 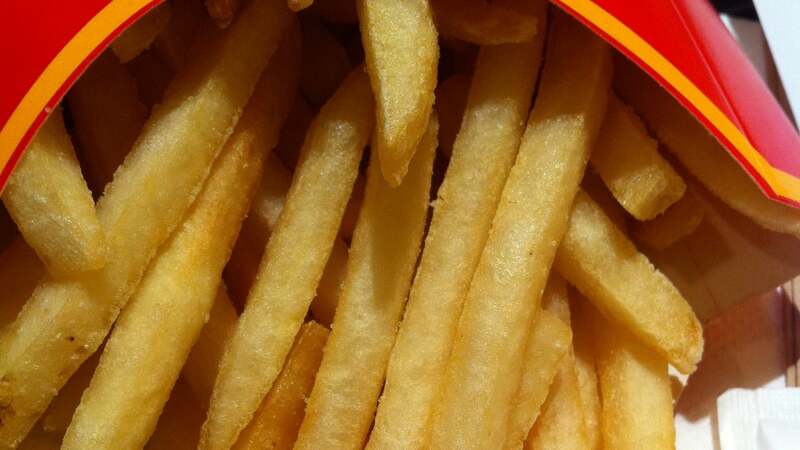 Just a few weeks ago, McDonald's released a video explaining the ingredients in their fries, and they mentioned this additive in the name of transparency. A Daily Mail reporter may have been the first one to make the connection. (It's hard to piece the history together, but the timing is right.) Their story published February 4 and was headlined "Short, back and fries! Scientists claim chemical used in McDonald's chips can cure BALDNESS and even regrow hair". The next day, Express ran a headline saying "REVEALED: Baldness cure hidden in McDonald's FRIES 'can regrow hair without transplant'" with no source given for that quote - the whole point of the technique is to prepare hair follicles for transplant. Dozens of reports followed, and even though many outlets reported the details of the story accurately, they almost all all found a way to cram a mention of McDonald's fries into the headline. So, let's be clear: The scientists used silicone to build their hair cell growing chip. And McDonald's uses silicone in their frying oil. That is literally the only connection. The silicone is not an "ingredient" in a baldness "cure". And it certainly doesn't "come from" frying oil, as if frying oil were a natural resource to be mined. Fukuda said he was baffled by the readers' misinterpretation of his research. "I have seen online comments asking, 'how many fries would I have to eat to grow my hair?'" he said. "I'd feel bad if people think eating something would do that!" I wish Gizmodo still had comments, because Ryan Mandelbaum wrote an article on the multiverse that was one of his worst. The multiverse is religion, and those who preach it are it’s high priests. It is based on fantasy, yet he mentioned that no where. Another of his articles mentioned possible experimental evidence for string theory. Again, garbage. String theory can be realised in more ways than there are particles in the universe. It is 10 to the power of a very large number. As such is can predict anything, and so is useless. Of course, on top of that, there is no actual theory behind string theory. You might as well support flat earthers. The SMH is claiming that Musk’s roadster will now collide with an asteroid. When did stupid become aspirational ? dont forget, Australian fries have very different ingredients to the "food" they make in the US.